I was looking forward to Tabletop Scotland as it had the potential to fill a gap that existed in our part of the country. We need things to take out minds off the grim state of the world in which we live – all those wildling attacks for example and the growing threat of White Walkers in the garden. Plus Brexit. The Glasgow Games Festival is lovely, but it’s only a single day event. It’s a great place to play games but it doesn’t have the seminars or any demos from big publishers. You bring your fun with you to the GGF. 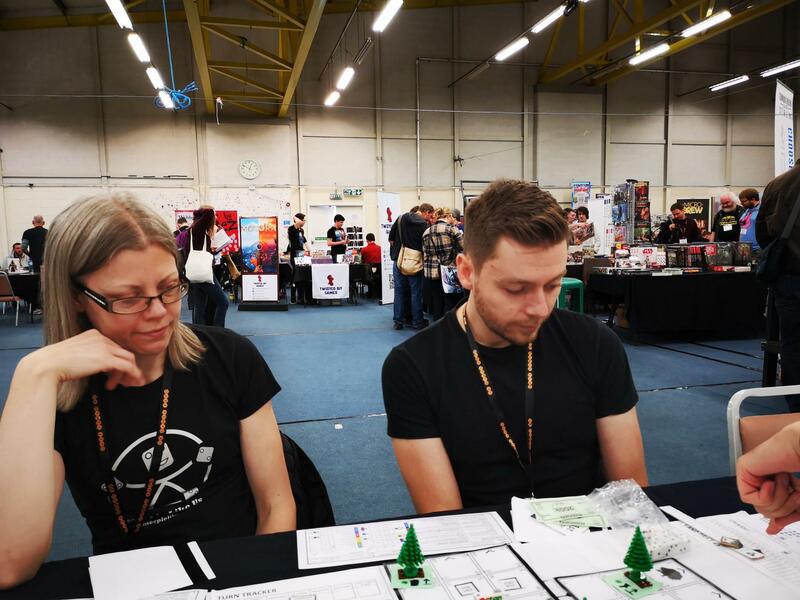 Tabletop Scotland offered events and seminars, several RPG events of various stripe for which you could sign up, and a couple of larger publishers demoing a wide range of games for hobbyists and families. It also had a vibrant roster of independent designers along with a healthy number of purchasing opportunities. Opportunities, it has to be said, that I always watch warily. I don’t want Mr Meeple getting too close to a cash register if it’s in the vicinity of games for sale. He can’t be trusted with his pocket money. The main selling point of Tabletop Scotland though is that it’s only a fifty-mile trip to get from Castle Black to Perth, and the same to get back. Compared to the trip from Brechin to Birmingham, it’s easier to work up enthusiasm to visit. You need to psyche yourself up for an 800-mile round trip. Usually I do that with a playlist of funky jams from 80s sports movies. You’re right, Joe Esposito. I really am the best around. Perth is much smaller than Birmingham, and venue capacity and ticket sales suggested that this event would have a good buzz without being too crowded. We’d also had a few conversations with the TTS organisers and so we knew them to be good people. 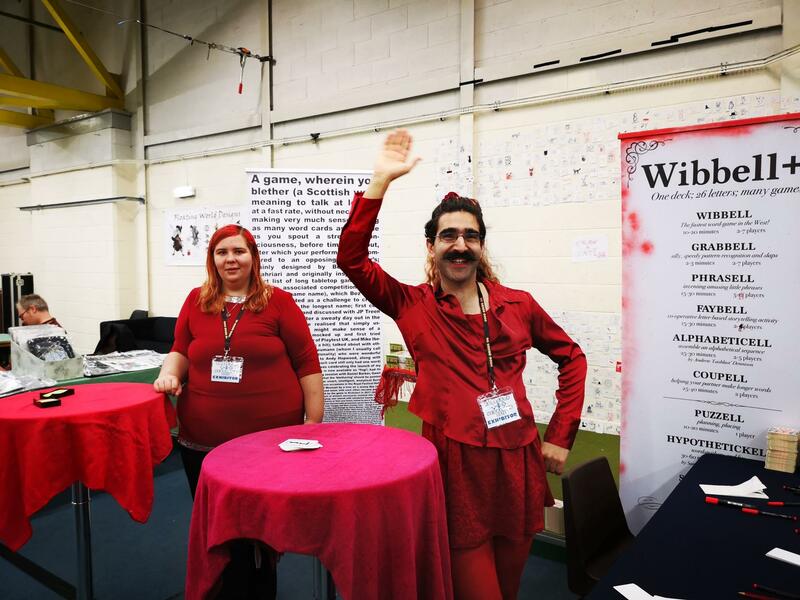 Duncan had introduced us to Meeple Circus at GGF, and he and Simon had also got us hooked on Chinatown at UKGE 2018. I knew the team wanted to make this event family friendly, and optimise the venue for maximum enjoyment rather than maximum profit. That’s the reason I assume behind the large family gaming zone, the generous space between the gaming tables, and the equally generous stands for the exhibitors. They also offered free entry for children under 10 (accompanied by an adult). 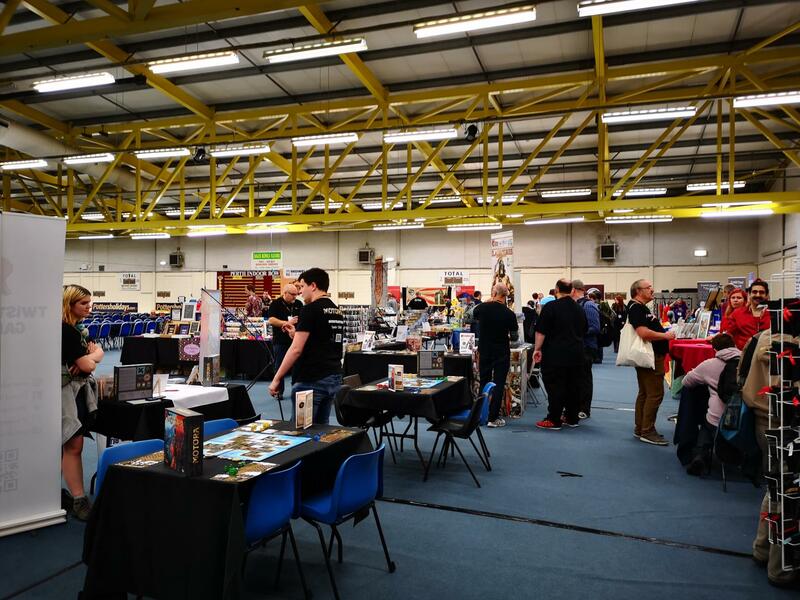 This all sounded very promising – aimed at growing the hobby – and seemed likely to be less overwhelming than UKGE can get at peak times. It seemed like a good way to spend a weekend. Despite all this I hadn’t really given Tabletop Scotland much advance thought. Mostly my mind was on working out if I could fit in a Parkrun (unfortunately not) and how I could reschedule my regular long run around the weekend away. Whilst I thoroughly enjoy tabletop gaming in the comfort of my own or a friend’s home, I don’t really feel like I’m part of the gaming community in the same way that Mr Meeple so clearly is. Board gaming is his main hobby. At least, I think it’s his main hobby. A close second would be saying ‘Let’s watch a movie’ and then paging through Netflix until it’s too late for us to watch anything. My main hobby is running. I’m very much wired into the running community: I’m a member of an affiliated running club, have helped set up a fledgling club in my current home town, and also sometimes run with a third fledgling club in a different town. I’ve literally been around the block thousands of times. 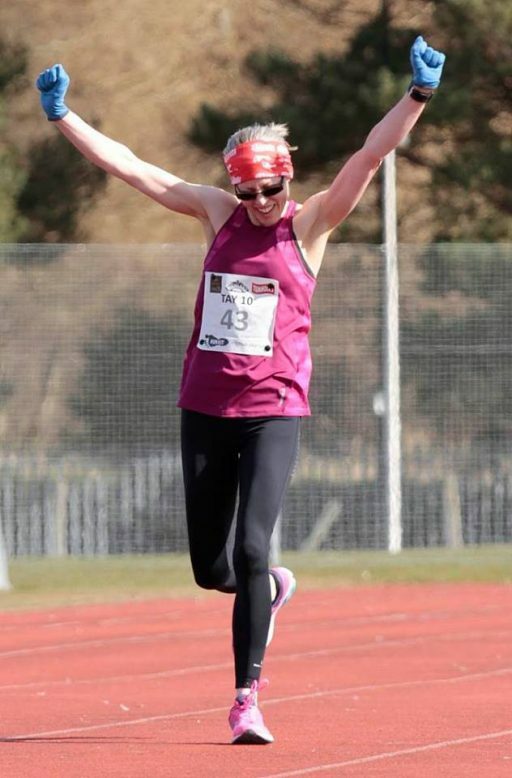 I’ve taken part in several races this year, and I’ve blogged about them over on my own blog. I’m active in a couple of Facebook running groups too. I’ve got my first marathon in three weeks’ time, and that’s been a large focus of my life for the past few months. Mr Meeple on the other hand would never join a running group. He does thirty minutes a day on an exercise bike but in his own words ‘every minute of that is the worst minute of his life’. He spends a lot of time connecting with fellow gamers through social media, or angrily typing tweet responses that he deletes before sending. I sometimes wonder how he finds the time to do it. And then I remember all the time I spend organising running events, running, blogging about running, and discussing running with running friends whilst out running with them. Running running running. 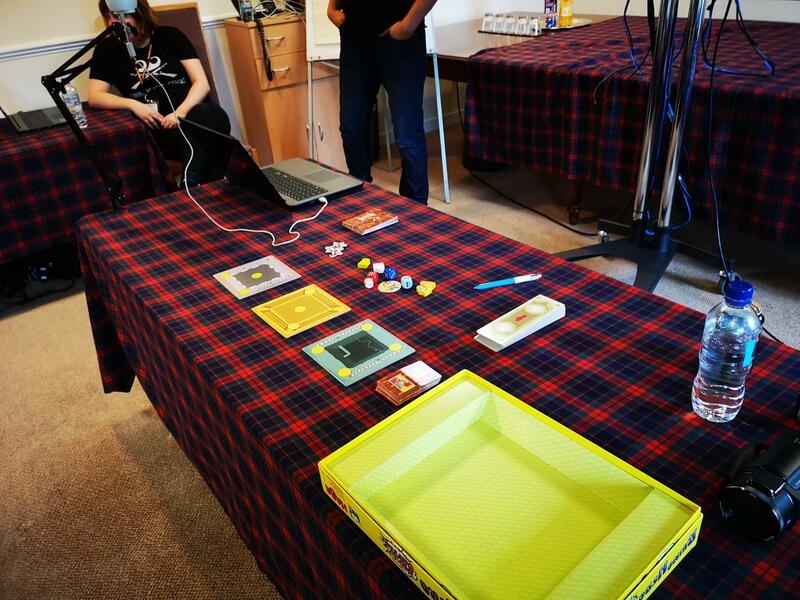 Tabletop Scotland also coincided with the end of the first week of the semester, so my focus was largely on surviving the start of the new academic year. That’s always a rough time – mostly the first Friday after the students come back is spent reloading my shotgun and watching the boarded-up windows of the staff room with the thousand-yard stare of a zombie apocalypse survivor. 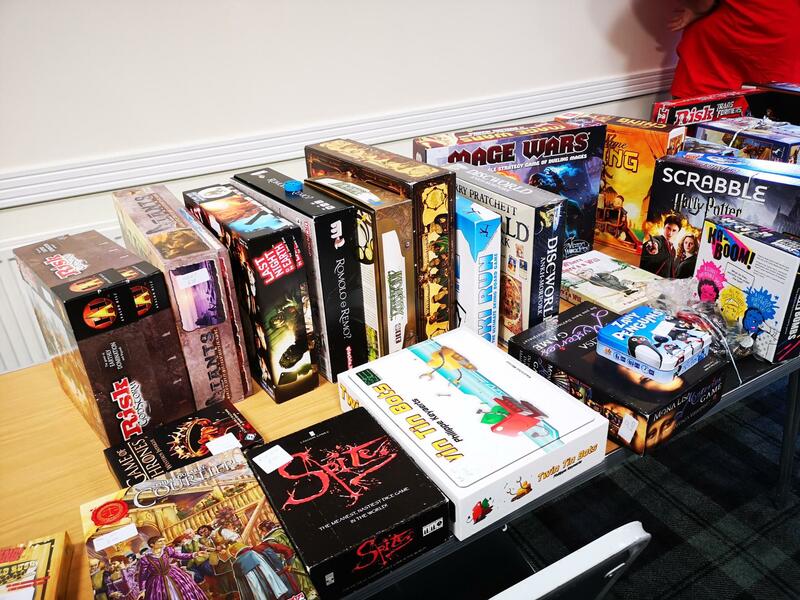 All of that is partly to explain that I’m coming to this not as a novice gamer by any means, but also not as someone who feels like a core part of the Scottish games community like Mr Meeple seems to be. It’s also getting my excuses in for the seminar, into which I put even less thought than Mr Meeple. I assumed he had it covered, because the seminar was his idea and it’s not like he didn’t know it was coming up. Mr Meeple rolled me into a car at 07:30am on the Saturday morning in the freezing cold. The back of the car was absolutely full of games – some I’m pretty sure I had never seen before and might well have been purchased, stored and then packed up for the bring and buy without even being opened. 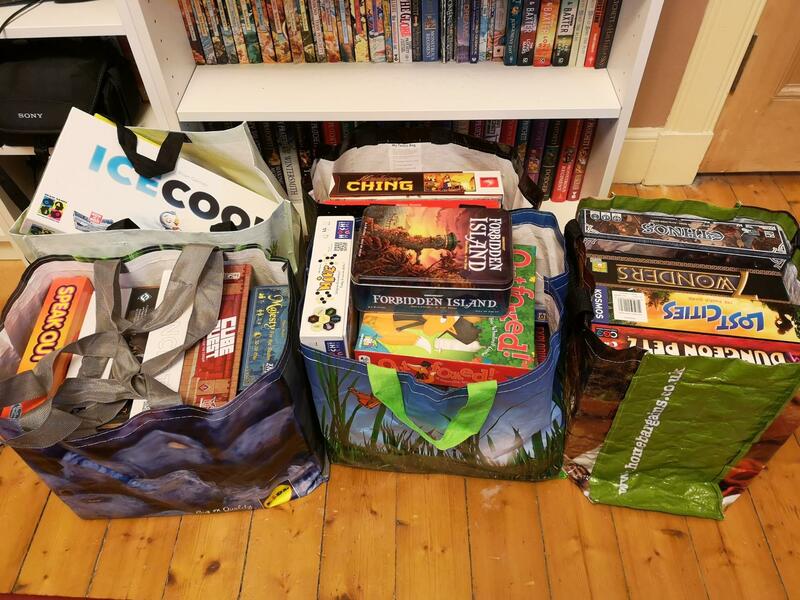 The boot was full of other stuff – a big bag of games for playing (not needed). A couple of video cameras (not wanted). A drum made of a bear skull for some reason. Lots of stuff. There was barely room for me but I didn’t make a big deal about it. I thought if I said ‘it’s the games or me’ I’d probably be pretty angry at the answer. Since I had been out more evenings than expected the previous week, Mr Meeple had actually cooked for me a couple of evenings. He always takes a vacation during my first week of teaching: I think he does this so he can gloat about relaxing whilst I am dealing with a severe shock to the system and getting increasingly tired as the week goes on. I had a ready meal that needed eaten. I track my weight and calories and nutritional content and that ready meal is planned around my fitness regime and diet. However, when given the choice between ‘a scabby ready meal’ and ‘Mr Meeple’s ridiculously indulgent pasta’ it’s rare that I take the long-term view. Instead of my usual overnight oats, I had prawn, chicken and chorizo paella for breakfast. This was perhaps the healthiest thing I ate all weekend. We stopped off in Dundee to get refreshments, which meant water, Pepsi and chocolates that I didn’t want but still happily ate. We were able to get parked at the Dewars Centre no problem – early reports had been it would be £10 for the day but free on Sunday. That seemed reasonable for the weekend, but the staff at the Dewars Centre are absolutely lovely. When we were heading out for lunch the nice lady on reception asked if we were leaving and told us to get our parking ticket validated. Event attendees get parking for only £1! Her main concern was making sure the word got out – the people of Perth clearly aren’t used to the cutthroat price-hikes that are supposed to accompany conferences and conventions. Although we were early, there was already a queue of perhaps 40 people in front of us. People in Tabletop Scotland t-shirts were managing the queue and splitting it into sub-queues of people who had pre-purchased tickets and those taking the risk of paying on the door. As soon as the doors opened, we were ushered into the main hall with admirable briskness and got to enjoy the pleasing cool of the conference centre. That pleasing cool wouldn’t last. I think we were told at the end of the Sunday that the heat from the event had actually melted the adjacent ice rink. Despite the queue to get in, the main hall still looked pretty empty at that point – it would fill up over the course of the morning but it was clear that gamers, as a rule, are not early risers. We had a quick chat with Sarah from One Free Elephant, who was still in the process of getting their tables set up. We also got a very brief viewing of the seminar room before it was taken over for the day by a stamp collecting group. That meeting didn’t seem like it was really the ideal choice for a board game convention, but apparently there had been a double booking. I wonder if there’s a game about stamp collecting. Let me check boardgamegeek. Yes, of course there is. It’s called Philately. What have you done for me Philately? Our cursory inspection of the room suggested it would be fine for our needs. It had five tables we could use. The chairs were the kind that my grandparents had in their sun lounge – heavy, bulky things with leather seats and large wooden arms. They were certainly comfortable but they’d need to be moved out of the way for us to enact the seminar ‘plan’ that Michael had explained in the car. We wouldn’t be able to get back in to the room until 5pm but we didn’t have a presentation or box of handouts this time. Only a handful of people had signed up to the seminar so we thought it would be fine. No worries, mate. The next stop on our tour was the sumptuous quiet room – it looked like a boardroom and had even been set up with drinks and water. It was nice and cool and quiet, and I imagined we might spend some time there whenever the noise and buzz in the main hall got too much for us. In the end we only visited it again once for a couple of minutes. At that point we had burst in on a couple of people silently making use of it and undermined its description for a little bit. Next port of call was to find the Bring and Buy room. Mr Meeple had optimistically decided to bring 35(!) games to attempt to sell. Thirty-five games that we’d collectively decided we didn’t need to keep in the collection. I vetoed the Fox in the Forest from his shortlist but other than that it was just everything that could no longer fit on the shelves. 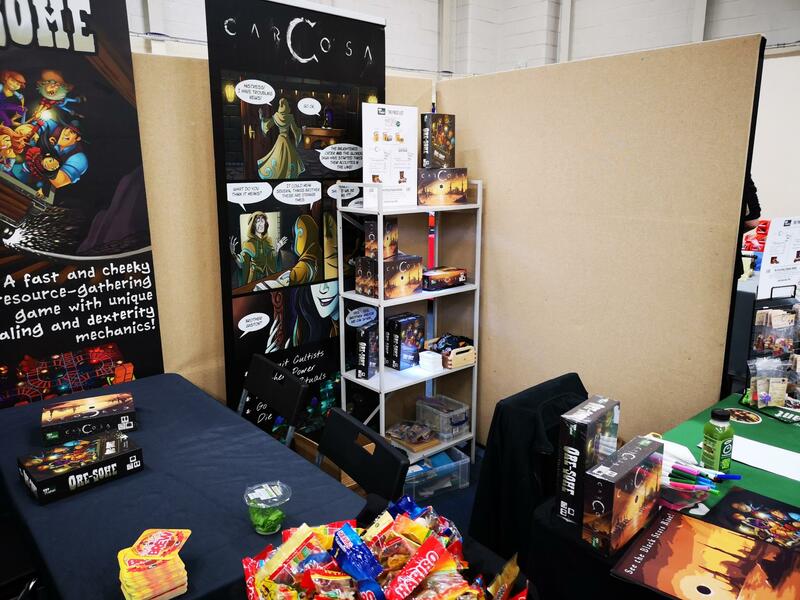 We’ve never taken things to the bring and buy at UKGE. These are games that we didn’t want, and I was skeptical anyone would want them. Especially Speak Out. I’m still not 100% sure he didn’t put that one in the bring and buy as a weird and perverse experiment into gamer squeamishness. When you don’t think people will want your cast-off games, you become critical about the idea of selling them. We’d need to transport them 350 miles to Birmingham. Then we’d need to lug bags of heavy games from the car parks there all the way to the convention. I would have assumed we’d do that only to have to lug most of them back again at the end. The thought of transporting them a mere 50 miles, and to a place with a car park right next to the venue, was much more appealing. We seemed to be depositing at least three times as many games as most of the other folk in the bring and buy queue, although I’m not sure we were the worst offenders in the end. There were several people in the queue behind us, but it took the poor volunteer so long to get through all our games that the queue was almost gone by the time we were sorted out. Katrina of the I Play Red blog was on one of the other tables getting games labelled ready for sale, and I assumed she was a volunteer. It turned out though she had just turned up to the Bring and Buy, seen they were overwhelmed by the number of people trying to hand games in, and kindly offered to help out. We could have so easily have done that ourselves, but didn’t even think of it. That’s a good rule of thumb for Tabletop Scotland – almost everyone is nicer than we are. We thought we’d definitely sell at least 10 or so of them – there were some well regarded games in there after all. People seem to love Ethnos. Dungeon Petz is very well reviewed. We had Magic Maze. The Mind. Hanabi. A whole pile of decent things, but we’d never done a bring and buy and had no frame of reference. We thought we’d sell maybe half if we were lucky. In the end, all but two of the games sold. We had a bit of a panic at 8pm on the Saturday when we asked a volunteer about how we collected our sales cash and were told we had to have collected it by 6pm (at which point we were still in the seminar). Thankfully one of the TTS organisers came along to ask how the seminar went, and informed us our cash was in an envelope at the front desk. In the end it paid for our hotel, meals, travel expenses and our other miscellaneous costs for visiting. There was even a bit left over, although since I saw Mr Meeple browsing Chaos Cards I’m not sure there will be much left over for long. After the Bring and Buy deposits we returned to the main hall around 10:00am. It had filled up quite nicely but wasn’t yet quite full. There were plenty of gaming tables available so we decided to grab one and head for the excellent library to get started with a game. However, both of us being comically unobservant, we picked a Playtest Zone table instead of one of the general purpose ones. One of the cool things about Magnate is that it takes into account market forces. It all ends with a cataclysmic crash, and when this happens depends on players actions and the shared impact of sales and purchases. You’re all basically trapped in a Stephen King version of the Tragedy of the Commons – no matter how well it seems to be going you know it’s going to end in horror. Shortly after James explained the rules, another player came to join the session. This was a lovely fellow called Iain, and he tweets under the name of Unpopular Mechanics. Our playtest of Magnate was a thoroughly pleasant way to spend an hour and a bit. 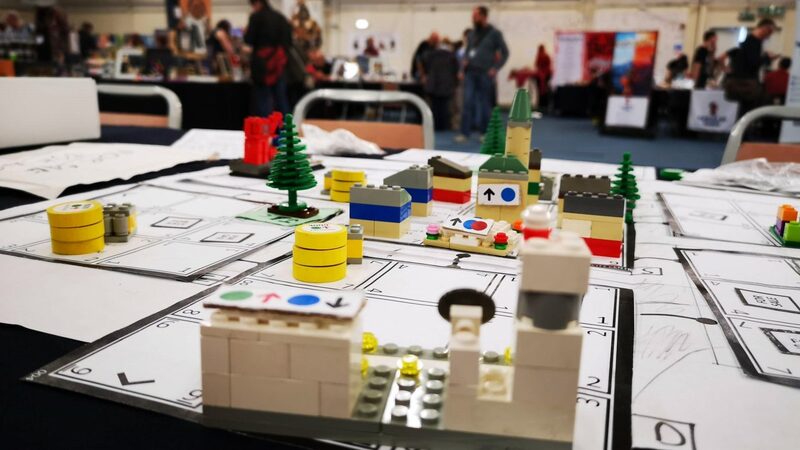 It’s a common theme in these convention reports that Mr Meeple has no idea how to win games, and it was as true here as it ever is. He threatened to crash the market by starting to cash out on all his properties after I had just paid close to $4 million for some land and an office block. I think he realised things would go badly for him in the real world if he did that. Yes, Michael – the metagame of Magnate is you sleeping on the sofa. But still, you never know what dumb, unexpected thing he’s going to do in an attempt to make people think he’s smarter than he is. I started cashing out in the next round before tanking the market. I won by several million dollars. I don’t think Mr Meeple actually disclosed his ‘score’ at the end but I know that just like in real life I could buy and sell him several times over. In real life his net worth is pretty much defined by whatever is in his wallet. His tangible assets are doubled by filling his car’s petrol tank. I loved Magnate, and not just because I won. The market mechanisms, whilst obviously simplified for the game, are logical. 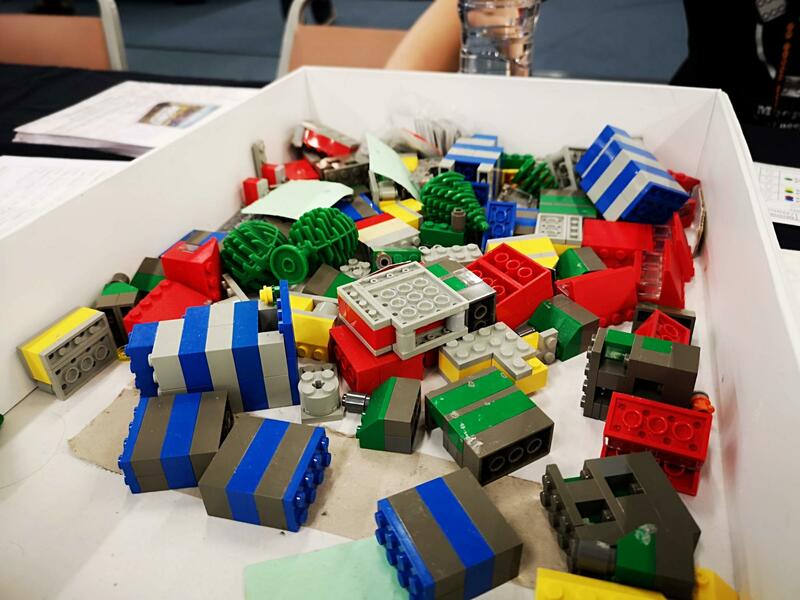 I loved the tactility of the buildings and tenants, although I don’t think the final version will be made from Lego. It’s only at prototype stage but I think it could be decent from a visual accessibility viewpoint, if the money is designed properly, and it’s just satisfying to handle large, solid playing pieces. It feels nice to whomp down a pile of discs that represent hundreds of thousands of pounds in income per turn. After a bit of a wander, Mr Meeple wanted to check out the Bring and Buy as a punter. I was worried, not without precedent, that he would end up replacing all the games we managed to sell. I talked him down from a couple of games he was tempted by – not because I thought they were bad but because I reminded him we had just offloaded games because we had no room to store them. He grudgingly agreed, although I did see him wistfully eying up a massive box of Twilight Imperium. For that one I reminded him that it needs about six players and as many hours, and we don’t know enough people willing to spend that amount of time in our company. There were a lot of games still for sale, but not as many as we’d expected given it only opened for business at 11:00am. However, Matt Coward (a PhD student at York who was volunteering at the event) informed us they’d had to open at 10:00am as the queue was all the way out the other room and blocking access to the catering facilities! Gamers will do anything for a bargain. Except, I guess, buy a second-hand copy of Speak Out. Whilst Mr Meeple was searching for games to be tempted by, I was trying to see which of our games were still up for sale. I could only find about 8 of them, but was assured there was no stock being held back for later in the day. Things were looking up for our budding mercantile adventures. Mr Meeple wanted to see if we could find people to play a game with but I’m like a gremlin and need to be fed at regular intervals. The canteen was pretty busy, so we decided to head into town for lunch and ended up at Pizza Hut. Luckily there are lots of restaurants and cafes and pubs and shops in easy walking distance of the convention centre if you don’t fancy that option. Back at the Convention we had another wander around and took a few photos of the now full hall from the upstairs gallery that was hosting several RPG adventures. Whilst taking the photos, Michael recognised an old school friend in the HABA family area, and we headed down to chat to her. She was having a great time and had found the convention really welcoming. There were plenty of games suitable for her young son, no queues for tables, and enthusiastic demonstrators available when needed. She also loved the QR code on her son’s ticket: if any child ran off or got separated from their parents in the crowd, then their parents could be easily be identified by convention staff scanning their QR code. Ingenious! 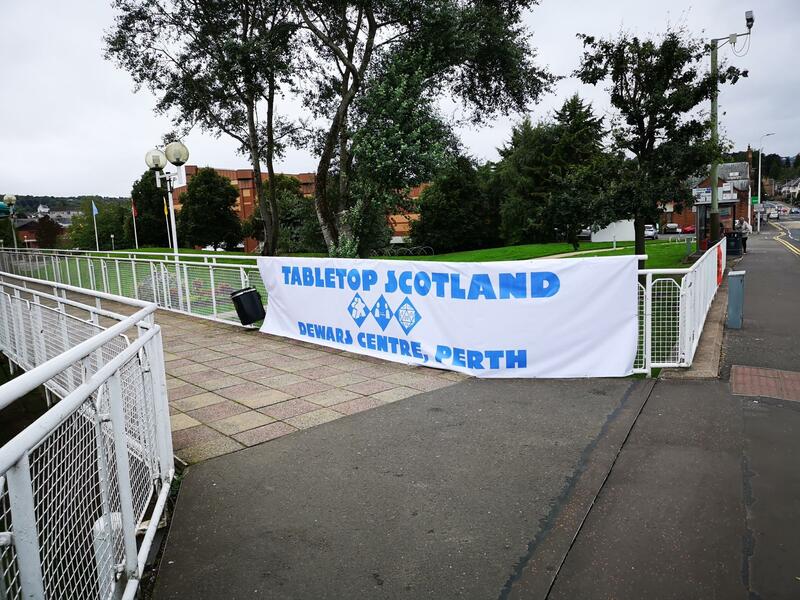 For more of our Tabletop Scotland 2018 coverage, you can check out Michael’s review of the event, and part two of my coverage.